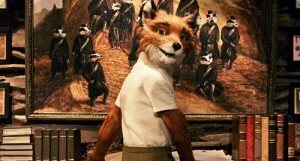 George Clooney provides the voice of Fantastic Mr. Fox. Fantastic Mr. Fox—the story of a clever, quick, nimble, and exceptionally well-dressed wild animal—is a 2009 animated comedy adventure film adapted from Roald Dahl’s classic children’s novel and directed by Wes Anderson (Moonrise Kingdom). A meticulous work of stop-motion animation, it features voice performances by George Clooney (The Descendants), Meryl Streep (The Iron Lady), Jason Schwartzman (TV’s Bored to Death), Willem Dafoe (John Carter), Michael Gambon (Harry Potter and the Deathly Hallows), and Bill Murray (Get Low). The critically-lauded PG-rated film was release in U.S. theaters in November, 2009 to a healthy domestic box office gross of $21 million.